Guadalupe on Guadalupe Street in Santa Fe, New Mexico photo taken by the illustrious, brilliant astrologer Erin Sullivan while living in the city of "Holy Faith"
Our Lady of Guadalupe - Nuestra Senora de Guadalupe - is the patron saint and Mother of the Americas - a multi-dimensional, cross-cultural icon of protection, hope, peace and love. She is my own personal "santa" and amiga, cheerleader and protectress. I call upon her in times of sorrow, confusion and distress, celebrate with her in times of success, jubilation and joy. 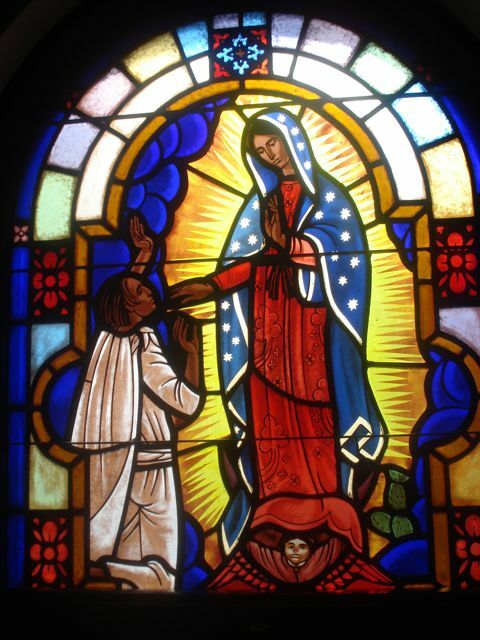 I will be sharing some of my favorite images of and information on this magnificently beautiful, intriguing Mother of the Millennium right here, on alacazem/guadalupe. Our Lady of Guadalupe inspires devotion from people of all races, colors, nationalities and denominations. Her message of "fear not, for I am here, I am your Mother" - "yo estoy hoy aqui, soy tu madre" - resonates for all those who have Mothers, i.e. all people and animals on planet Earth. Deep within our hearts and souls, we understand the power of motherhood and the necessity of and yearning for unconditional, maternal love. Guadalupe is also a symbol for the Mother Earth in many indigenous cultures she co-represents the ultimate nurturer and caretaker of us all. The photos at left and below were taken in Chihuahua, Mexico by Jacqueline Orsini Dunnington, author of Guadalupe - Our Lady of New Mexico , Viva Guadalupe! and Celebrating Guadalupe. She lives in Santa Fe, NM. Her books can be purchased @ amazon.com. 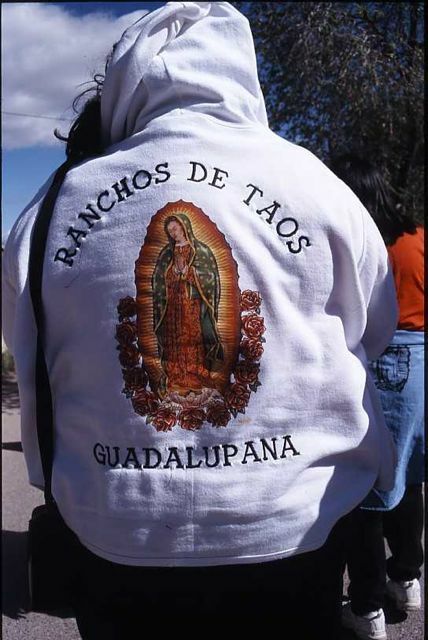 Guadalupe is frequently used icon on clothing. She can be seen on T-shirts, shirts, belt buckles, serapes, jackets and blouses. She is also a popular image for tattoos, and has shown up on the backs, arms, chests and torsos of men seeking protection and guidance from her for centuries. During Dia de Guadalupe celebrations, her faithful dress up in a blend of Hispanic, Aztec, Native American, cholo and gringo fashion that impresses even the most experienced fashionistas. 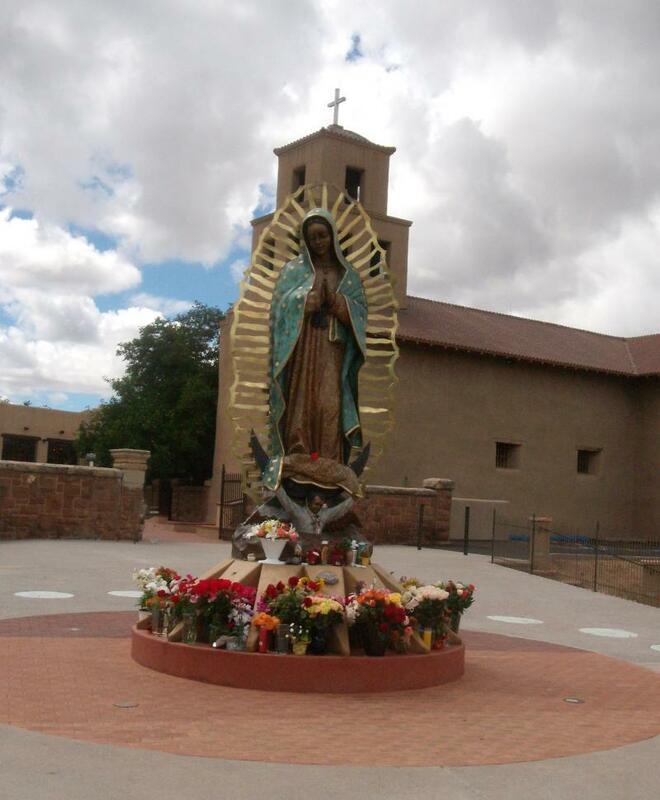 At the Santuario de Chimayo in New Mexico, pilgrims gather on each year on Mother's Day to honor Guadalupe as their spiritual mother and protectress. 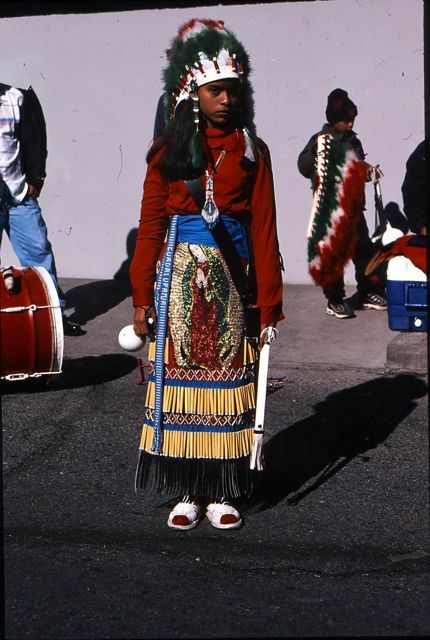 Native American tribes from nearby Pueblos walk for miles with banners and flags in processions and once in the small adobe church, pray and give thanks. Long the patron saint of the oppressed and poor, Guadalpe has become the madonna for the abused, neglected and abandoned. As a Mother and champion of strength and courage, she supports and encourages her faithful to fight for what they want, stand up for themselves and take action against wrongdoing. She is a pro-active madonna of action and justice, and has been a powerful symbol in the battle for human rights for centuries. In the Mexican Revolution of 1810, the Virgin of Guadalupe stood for insurrection and rebellion. Father Miguel Hidalgo used her image as a symbol of Mexican nationality, strength and hope.